PROVIDING QUALITY CHILD CARE TO CHILDREN FROM AGES 0-5 FOR OVER 25 YEARS!! 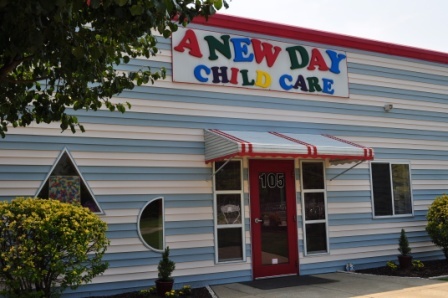 Teachers are long time employees, some with over 20 years of employment with A New Day Child Care. All Teachers are certified in First Aid, CPR, and SIDS Training. All Teachers have Child Care Credentials and Early Child Care College Courses. Over half have their AAS in Early Childhood. A story teller from Braswell Library reads to us each week and delivers new books to share with the classes. Separate playground areas for each classroom of children. All classrooms have reading, manipulative, block, housekeeping, sand, art, and music centers. We also have water and science centers.